Ringleader Sean Paul has accumulated a large group of furry friends (many rescued from humane societies across the country) and has put together quite the act. 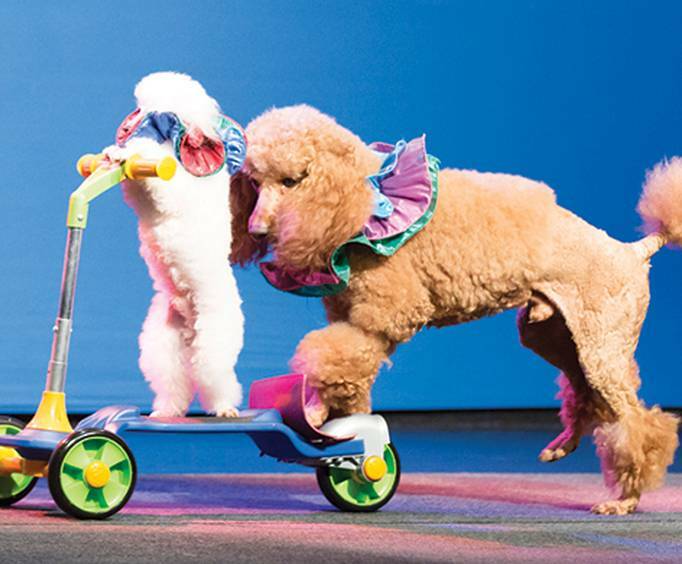 This two hour performance is sure to delight with awe-inspiring tricks and adorable creatures. Additionally, a number of exotic birds take to the stage throughout the performance for a great time of entertainment from talented critters! Watch impressive felines jump over platforms and through hoops. See silly canines balance on their noses and ride bikes. Hear the birds squawk and flap as they fly through the air. There are even talking donkeys and racing pigs in the show. These trained animals are absolutely beautiful and amazingly talented. The show features a troupe of astounding creatures who will impress with their intelligence and adorableness! 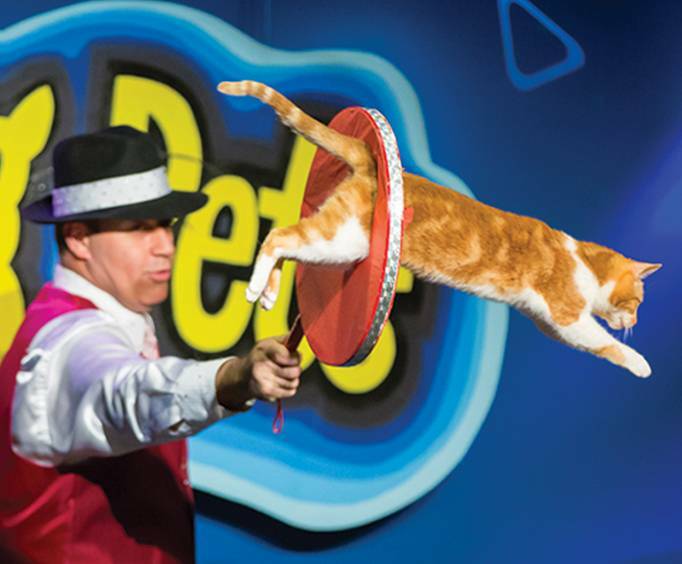 You will be stunned as you see trained house cats walk across tight ropes, roll barrels, and perform other tricks for guests. 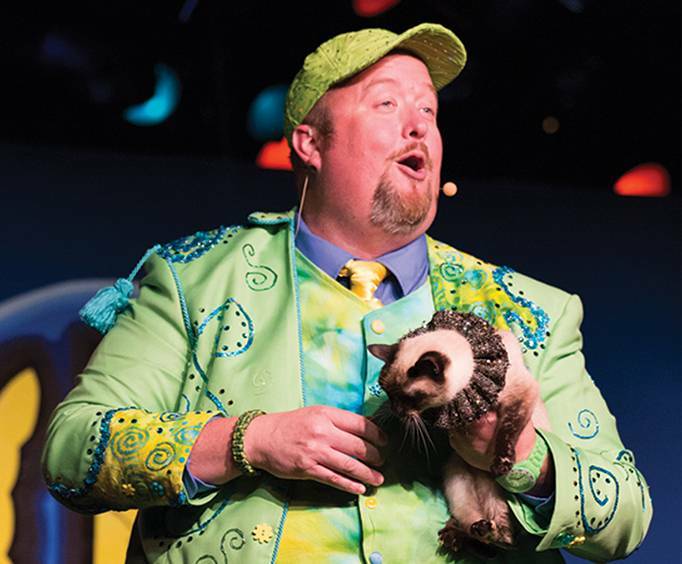 The live show features these cats as well as dogs and exotic animals that bring joy and laughter to the place. Most of the animals are rescued from dog pounds and shelters, going from a kennel to a stage only in Branson, MO! Amazing Pets Branson is located at the Grand Country Resort theater, Grand Country Music Hall. This theater is known for bringing a wide range of live fun to visitors of all ages. This beautiful resort is a great place to stay during a vacation in the Branson MO area. There are plenty of shows to see at this theater throughout the day, with morning, afternoon, and evening shows performed daily. As well as Amazing Pets, the Grand Country Music Hall features great shows such as Comedy Jamboree, Grand Jubilee, Down Home Country, New South Gospel, Branson Country USA, Ozarks Country, and Ozarks Gospel. Enjoy some amazing entertainment and fun during your Branson vacation at this beautiful resort. Animal lovers everywhere go crazy for Amazing Pets in Branson MO because it offers tons of awesome fun that people of all ages can enjoy, and there's no doubt you will, too! Let these brilliant animals make your day. You can't help but smile at their heartwarming tricks. Guests are sure to have a great time at this exciting live show! Get your tickets today! Approximately how long is the Amazing Pets? Wonderful!!! That is the best way to describe the show. My 2 year old watches the whole thing. I loved the show. I took my 3 grandchildren and i think i laughed more than they did. Great job!!! A great show with a very funny emcee and awesome pets.